Present day local termite assemblages, and the distribution patterns of the different evolutionary clades, result from long-term processes of diversification, radiation and dispersal, as well as the influence of contemporary environments. 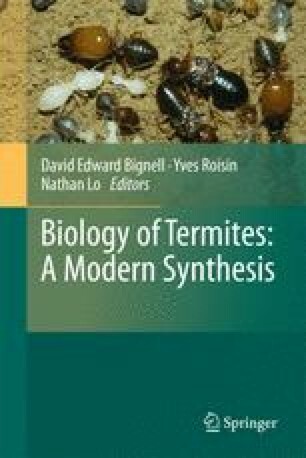 In the past four decades ecological studies of termites have been focussed on tropical forests and forest margins, and a corresponding theory of regional and global biogeography across the different biogeographical realms has emerged. What is now lacking is a comparison of the taxonomic and functional assemblage structures in habitats other than closed canopy tropical forest. To address this, we have compiled the generic assemblages of the five major biomes where termites occur (tropical rain forest, tropical savanna woodland, semi-desert, temperate woodland and temperate rain forest), designating and comparing 23 exemplar ecosystems around the world. The highest generic richness, with 62 genera, occurs in African Congolese rain forest, followed by Neotropical Guianan rain forest (55 genera), and then the Asian rain forest of northern Borneo (44 genera). The other three tropical rain forest sites, Madagascar, Australia and New Guinea, all have less than one third of the number of genera that occur in the Bornean rain forest. Of the six savanna woodland ecosystems, the African representative is the richest with 37 genera, followed by those of the Neotropics (25 genera) and Australia (24 genera). Temperate woodland and temperate rain forest ecosystems have the lowest richness, with three genera or fewer. The tropical semi-deserts have more genera than the temperate ecosystems. Soil- and humus-feeding termites have their highest generic richness in the African, Neotropical and Asian tropical rain forests, and decline across the other biomes. In contrast, wood-feeders are more evenly distributed across all the biomes. The evolution of different clades and their dispersal to other ecosystems are briefly discussed, and the implications for termite mediated decomposition are emphasised.